I've started on Susan's quilt. Lovely red and green Ohio Stars. It's a big one, so lots more to do on it. I haven't done a stash report since the beginning of August. I have been doing some sewing since then, and some hand stitching too. However, I've also been doing some shopping. I think I'll focus on the good part, first.... the stitching. This is my most recent finish. This one takes me up and around the top left corner. I'm on the home stretch! Here's a close up of it in place. And here's a picture of where I am so far. I'm ready to start the next rosette over. Nine more to go, I think. Like I said earlier, I had some fun shopping this month, and my in numbers show it, just a bit. These numbers go back to the beginning of August. Oh dear, that's a lot worse than I thought it was. Oh well, the stash needed refreshing. LOL! 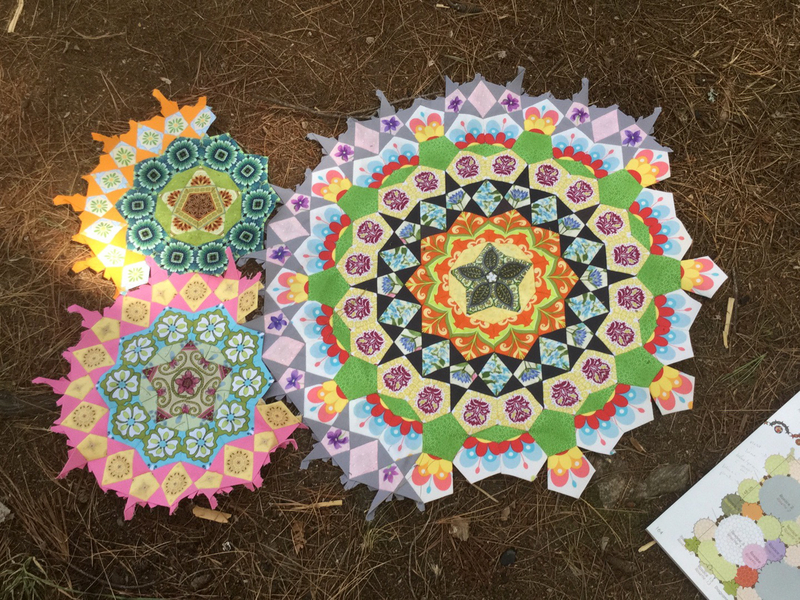 I was thinking that finishing a few quilts and a couple of backs would put me back in the black, but I think it's beyond that now. Ah well, it's been fun! I'm linking up to Judy's Fabric Report, Kathy's Slow Sunday Stitching and Angie's WIPs Be Gone. 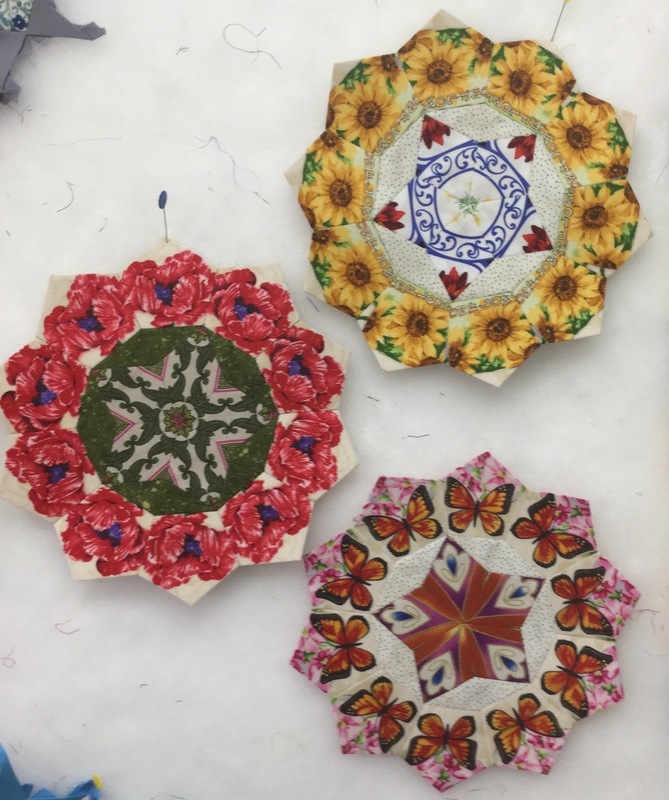 Then I think I'll start work on the next rosette. 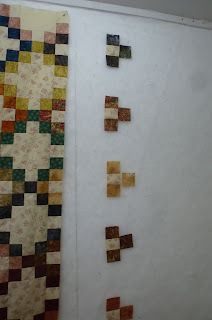 For some strange reason, when it comes to my quilting, I always think of September as the start of a new season, rather than January. Or maybe in addition to January.... sort of a just past mid year correction. It probably has a lot to do with the new guild year starting in September. Anyway.... now that all the vacation time is done, it's time to do some re-evaluating. Way back in January, I made up some lists of things I wanted to accomplish this year. It's a good bet that next to none of them are done. I know that because the lists are on the right hand side bar of this blog, staring at me. So, I am going to make an attempt to restructure the way I do things. 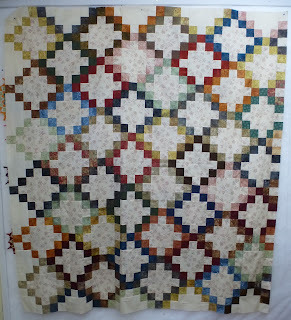 Starting this month, as in August, I am going to schedule in one of my own quilts to be loaded and quilted each month. I have 13 of them sitting and waiting. One of them has been waiting for over 10 years. I'll start with the ones that will take a basic pantograph, for starters, while I consider what I want to do with the ones that will require something more intense. But right now, I can't even see them all, let alone lay them out to get an idea of what I want to do on them. Also, in keeping with trying to restructure, I also want to get some of the UFOs and WIPs that are hanging around here also finished. With that in mind, I stayed upstairs sewing Tuesday night until almost 9 pm. Now that may not sound like anything special, but it's upstairs, as in the studio built in the garage. For some strange reason, I get creeped out when I'm up there by myself after dark. In the summer it's not so bad, because it's obviously light fairly late into the evening. But the days are getting shorter, so I'm going to try and get over that creeped out feeling. And the only way I know to do that is to be up there after dark. I think it's because it's so isolated up there. There's a connecting door that goes into the unfinished side of the garage, that then leads to a door on the main floor of the house. But if something were to happen where I needed to yell for help, no one would hear me. And that is really silly, since there is this wonderful invention that I always have with me, called a cell phone, that is a marvellous way of yelling for help. And really, I don't even know what I'd need to yell for help for! While I was up there Tuesday night, I got a few more rows of Texas Chain made up. 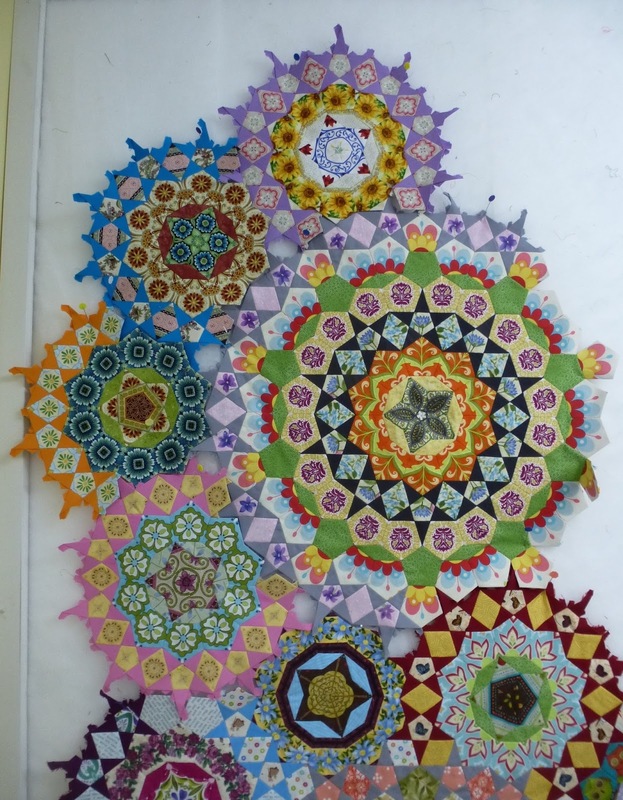 I'd like to get the last of them done at which point the centre section of the quilt will be done. It's only been up there on the wall since January. I have this pile ready to sew together. And then after that, it's the last 2 rows and the centre of this thing is done. 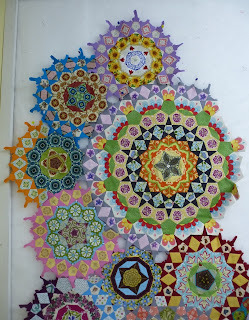 Maybe by the end of the weekend I'll have the centre put together and a start on finishing the borders. We arrived back from our wonderful vacation yesterday evening. What a restful vacation it was, too. For the first time in years, we had gorgeous weather through the whole thing. And because it was dry and non-rainy, the mosquitoes weren't the nuisance they usually are. So, now we are home, with all the post vacation stuff to do...... laundry, grocery shopping, banking, putting stuff away..... But today I'm back at work in the studio. I loaded a quilt belonging to Charlene, and started the quilting. This will be what I'm doing for the rest of the afternoon. This evening will be some of those post vacation chores. 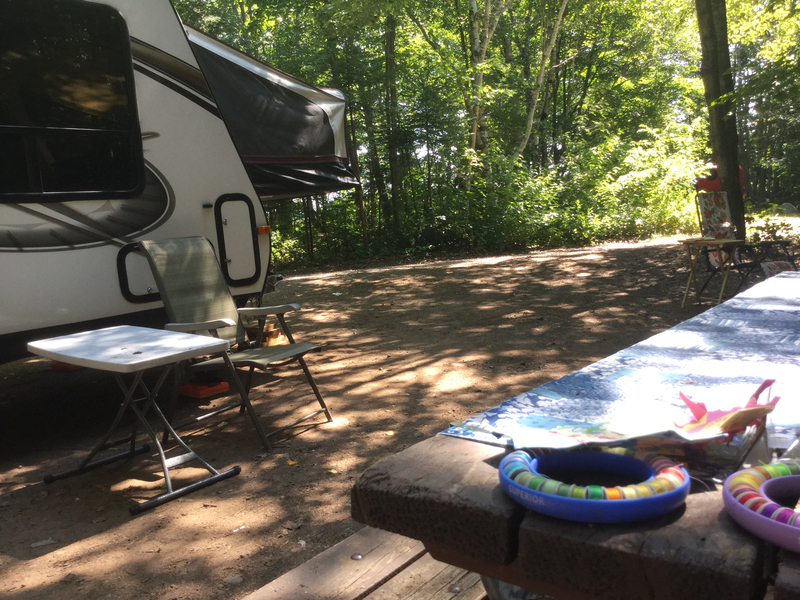 We moved on yesterday from Pancake Bay Provincial Park, down to Sturgeon Bay Provincial Park. We're staying until tomorrow, so that we can miss the busy traffic going south on hwy 400 from all the weekenders heading home from the Muskokas. After the long drive yesterday we are taking today to relax, before heading home tomorrow. In the meantime, I'm continuing to work on La Passacaglia. 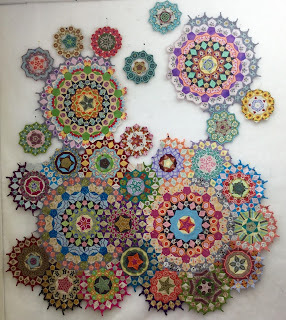 This is the beginning of the small rosettes that will go around the big one in the top left corner of the piece. Not much left to go now. I think I have the colour placements mostly figured out. 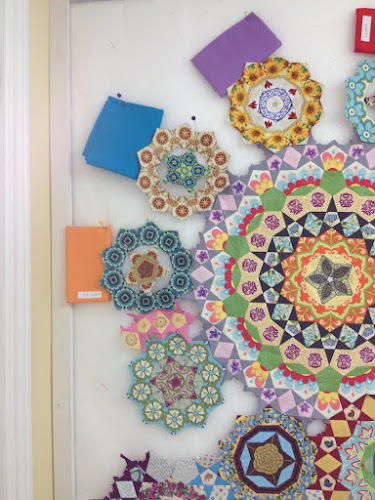 Before we left on vacation, I put everything that I had done up on the wall, and then placed up samples of star point colours that I thought worked well. This is what I'm going by as a guide for what I'm working on while we're away. I still haven't figured out the lanky thing while using blogsy on my iPad, so I won't be doing any links. So I'll post this, and go back to stitching. This is the first day since Sunday that we have not been out driving somewhere. Sunday we went from Craigleith prov. park to Grundy lake prov. park. 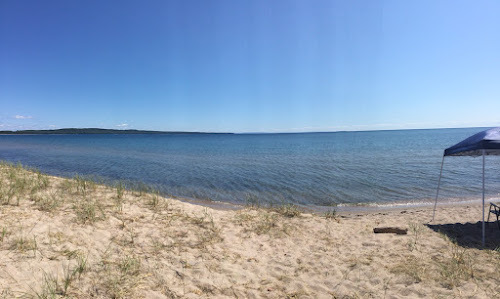 Monday we drove from Grundy lake to Pancake Bay. What a long drive that stretch of road from Sudbury to Sault St. Marie seems. Yesterday we went down to Sault St. Marie to buy our tickets for the Algoma train ride tour, which is scheduled for Friday. So, for today and tomorrow the plan is to stay put and relax. I must say that this is a gorgeous park. The campsites are huge, and very private. There are a good selection of hydro and non hydro sites, as well as pull through sites for those of us who aren't that great at backing trailers into various odd and sundry places. This is my view as I sit in the campsite, stitching away at La Passacaglia. And here below is the view from the beach of Pancake Bay. I've taken it in panoramic mode on my iPad, but I'm not sure how well that will translate here on the blog. If I could wish one thing to make the park much better, it would be to move Hwy 17 a bit further away. The park is right off the highway, so the traffic noise can be a bit loud. But after a while, it turns into background and able to ignore it noise. The view goes for miles, out across Lake Superior. During our travels this summer I've been stuck by just how huge this country of ours is, and by how much of the space in just our own province of Ontario is very sparsely populated. And Ontario is the most heavily populated of all the provinces. I did a little bit of trivia research and discovered that in the last census, our population for the whole country is 31 million people. That's not very many, when compared to the state of California in the U.S. that just by itself has a population of 33 million. We are so very blessed to live in this country. And on that note, I'll post this and go back to stitching. This little quilt has quite a large story behind it. The colourful braids were brought home from Africa a young lady who worked for the Governor General of Canada. She was able to travel the world for that job! What a fun experience that must have been. 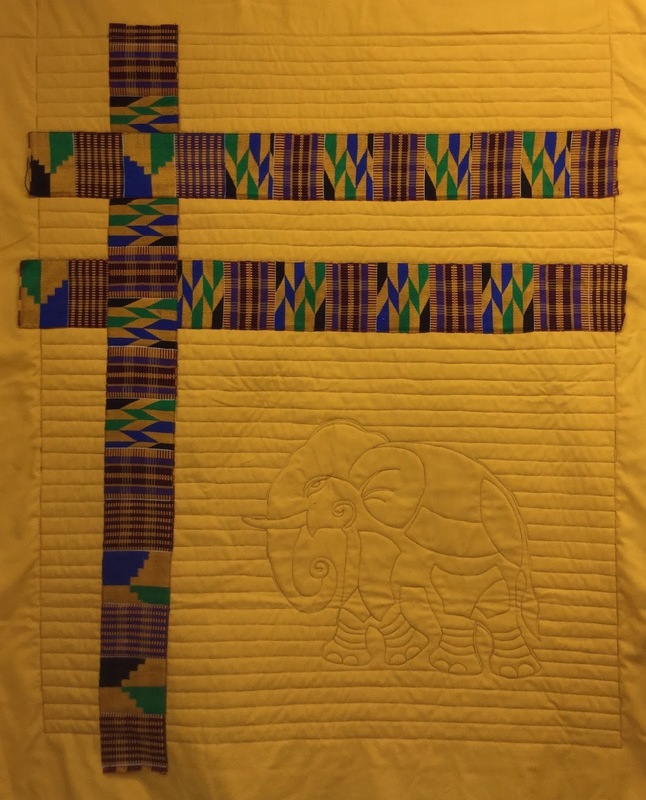 This quilt, using the African braid is for her first baby, or at least I think it's her first. 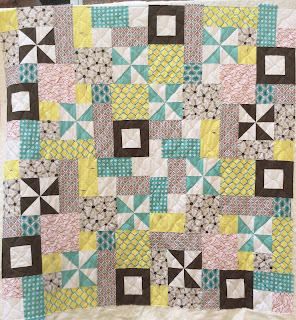 The quilt itself is quite modern, with lots of straight line elements in it, which determined the basic background quilting. 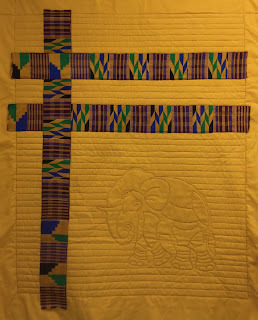 However, she also wanted something on the quilt that was very specific to Africa. We found a design on Digitech Designs called Elephant Fancy Jumbo. We left off the fancy hat, and enlarged the design to play a prominent part in the large open space. 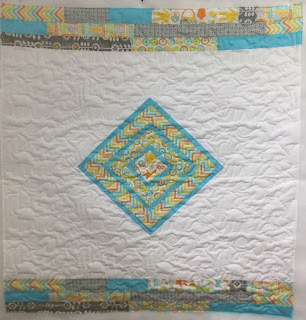 What a quilt to treasure with a heap of memories for that family. We've arrived at Grundy lake after a few hiccups. We pulled into the campsite, opened the trailer door and got hit over the head with a horrendous odour! I will spare you any descriptive efforts. We then pulled back out of the campsite and down to the dumping station and did lots of water putting through the systems. I will again spare you the details. We solved the problem, drove back into the campsite, and were immediately assaulted with a much more pleasant odour..... Someone was cooking steaks. I put on our supper while Scott got the trailer stabilized. We're having pressure cooked pork chops, boiled potatoes and some as yet undecided vegetable. I had to come down to the lake to see what was happening. 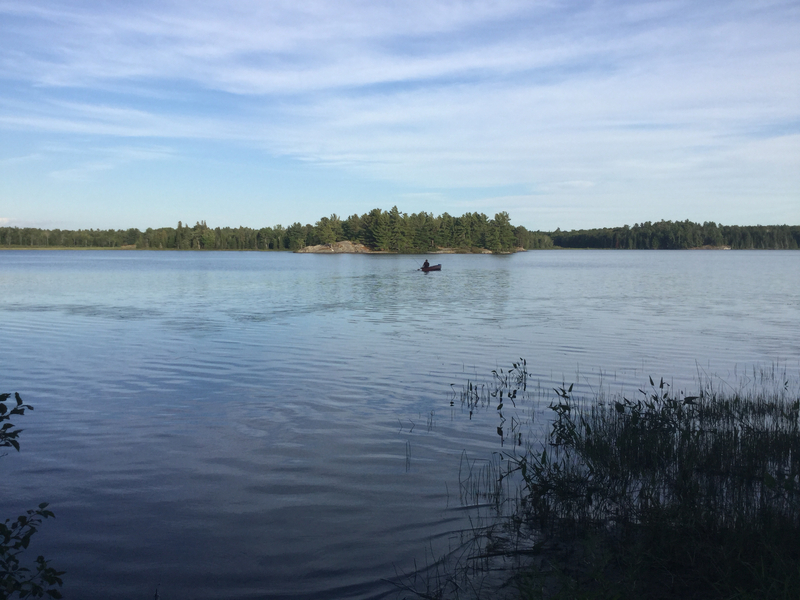 Someone heading out onto the lake in a canoe with fishing rods. I've said it before and I'll say it again..... I love this place! 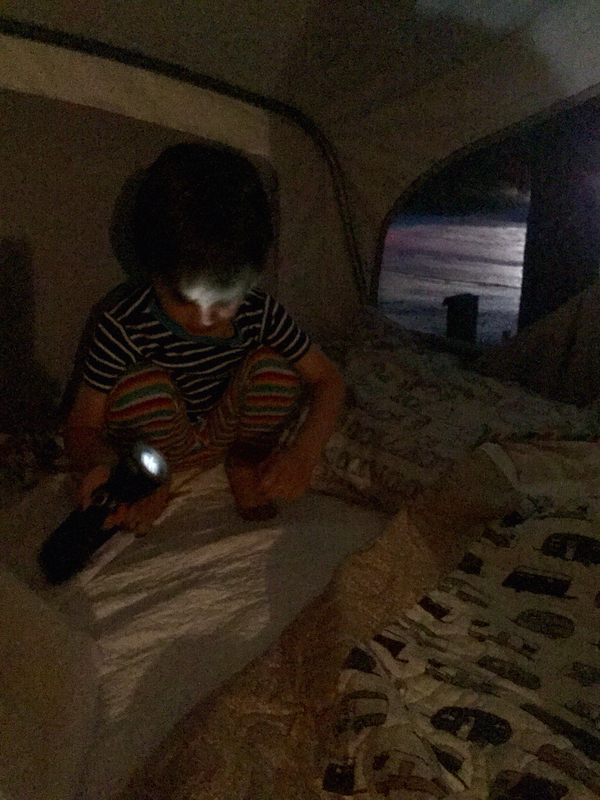 This little boy went for his first ever sleep over camping in the trailer last night. So much fun to have him. He didn't get us up until 7:15, which is sleeping in for him. We're about 15 minutes form Grundy lake, so I'll post this now before we lose service. 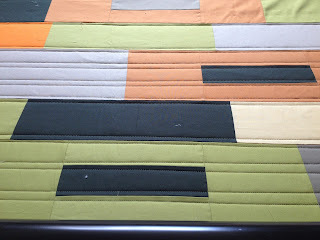 I am getting to like the look of modern quilts more and more. 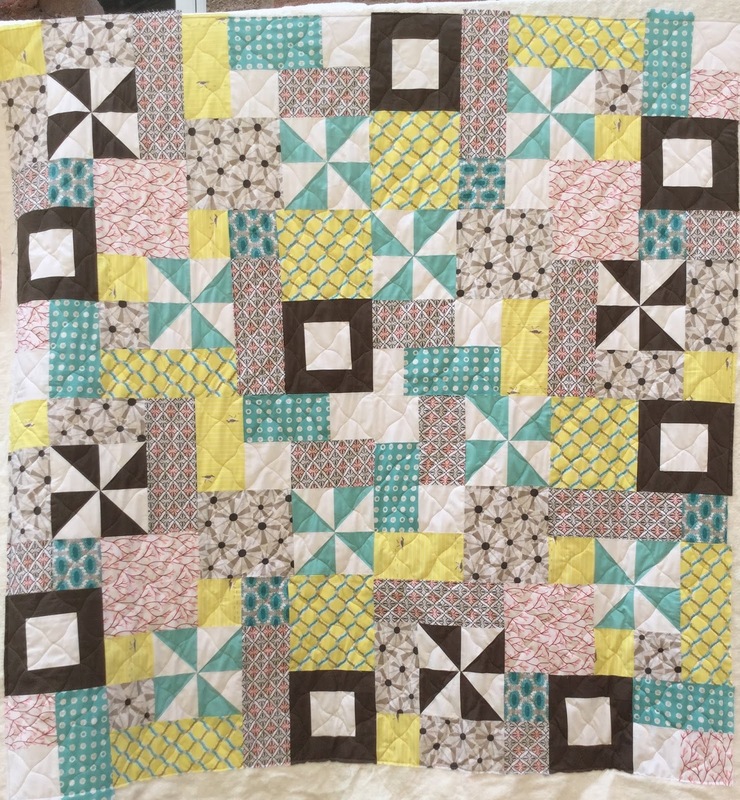 Their simplicity leaves lots of space for fun quilting to show. 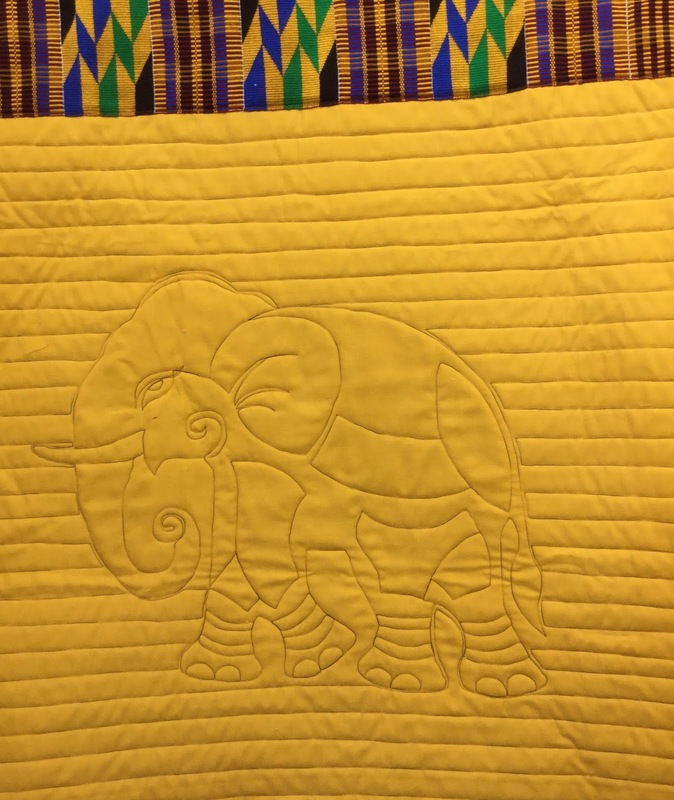 In this case, once I saw the giraffe in the fabric in the centre square, I knew it needed to be quilted with the Animal Crackers pantograph. 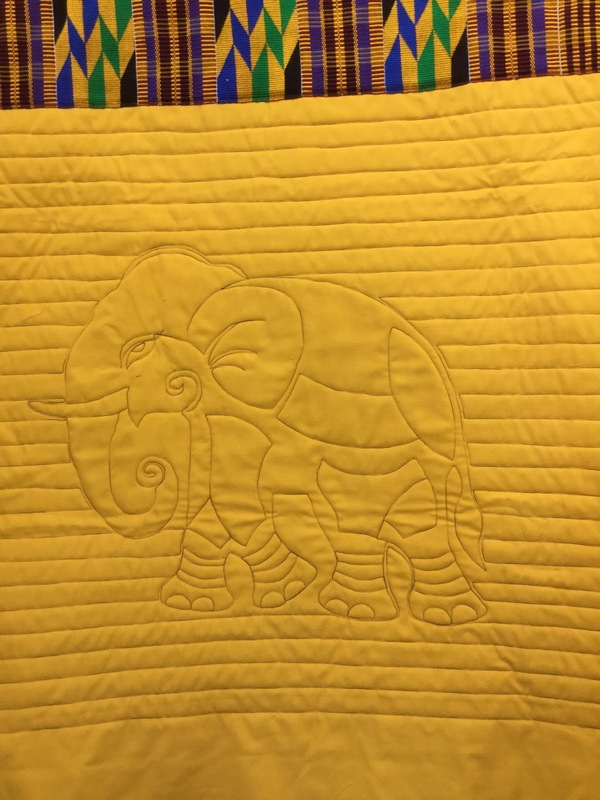 The lions and elephants and giraffes in the quilting design help keep the lonely giraffe in the centre company. This is the third of Christine's quilts, a garden themed sampler. It looks rather Thimbleberry to me, but I'm not sure if that is the pattern source or not. 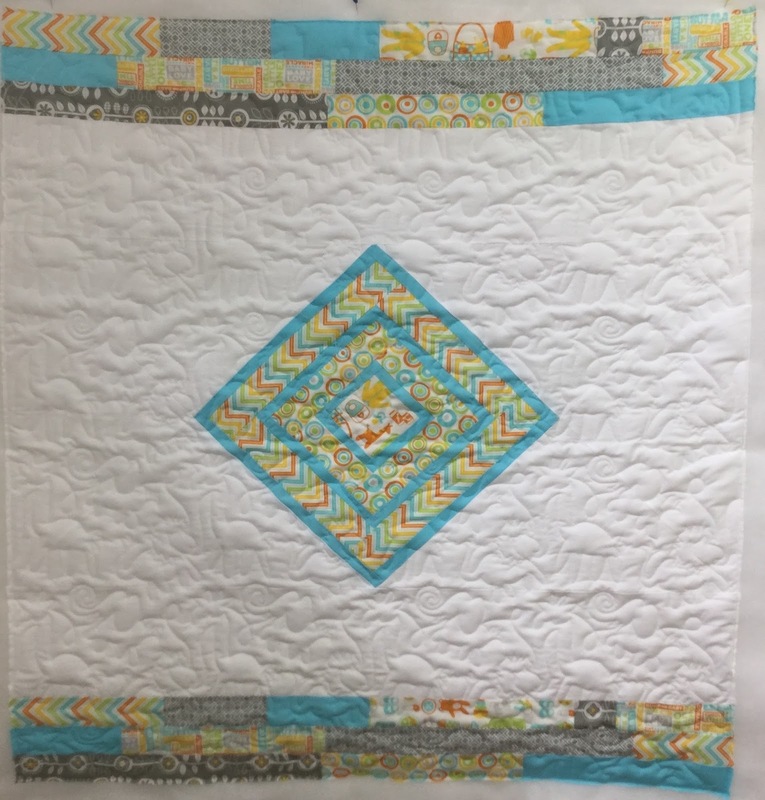 With sampler quilts, it's always a hard choice to make between custom quilting every element in the quilt, or to do an all over design to tie it together. In this case, we decided on an over all large free hand swirl. The centre house, instead of receiving swirls, was outlined and stitched in the ditch, just to set it apart from the rest of the quilt. 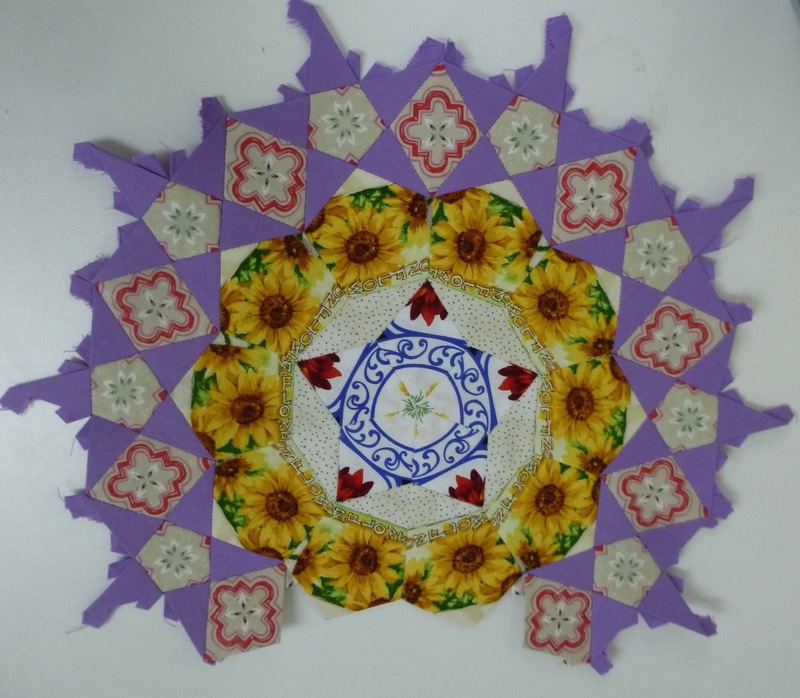 This is the second of Christine's quilts. I'm not sure what the official name of the pattern is, but I'm calling it Stacked Bricks. She's used more of that wonderful neutral colour palette in this one. 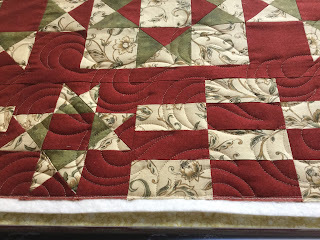 I quilted it with a free hand loop de loop design. 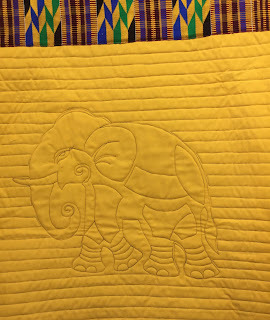 This is the first of three quilts that Christine brought me way back at the beginning of May. As usual, I'm behind on getting these documented. Each one of her quilts was unique so I think each one deserves its own post. This quilt used some organic cottons from Birch Fabrics. I love the colour combination, a lovely gender neutral palette. I quilted it using wavy cross hatching, called to the smallest square. 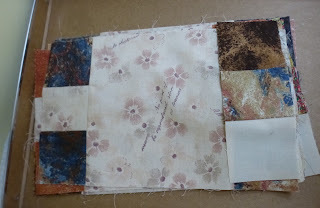 I was having so much fun, and was getting so much stitching done yesterday, that I didn't have time to write about it. I have four more stars for the centres done. There are four more outer pentagon rounds done. Here they are, paired up with the centres I think each will have, plus two more centres that need rings to go with them. And earlier this week, I finished three more of the small rosettes. And here's everything pinned up to the design wall. I'm not sure if this is their final placement or not. 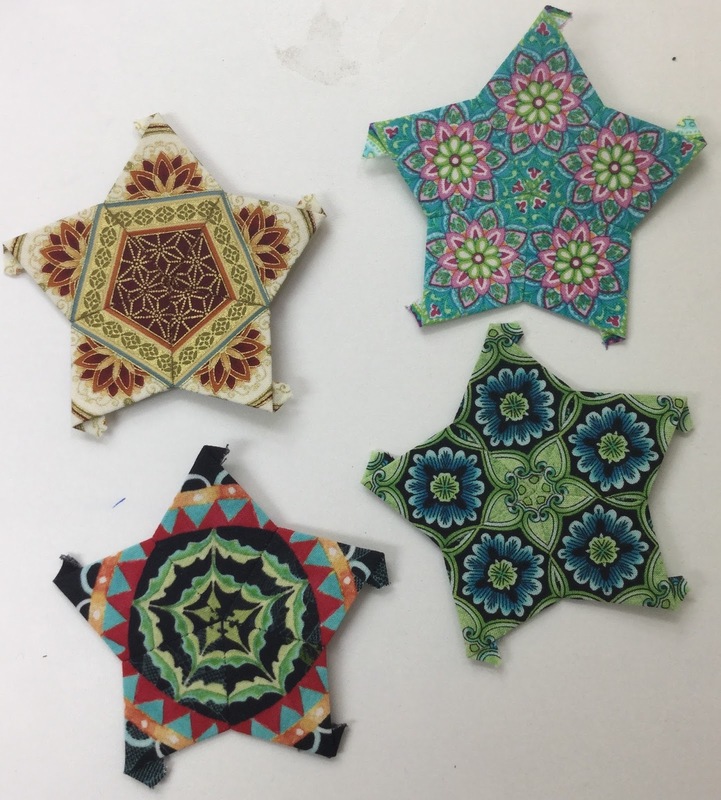 I have to start making some decisions about outer star point colours for these rosettes, which means deciding where they are going to be in the final placement and that is getting hard to do. 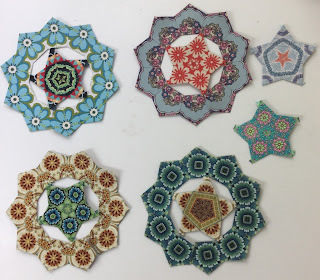 None of these rosettes are finished, which means I can't subtract them from the stash used column yet. And I haven't been working on anything else that I can subtract yet, either. However, I had 9 more yards of fabric come in this past week. I'm going to link up to my usual places, Judy's Fabric Report, and since it's Monday, Judy's Design Wall Monday, Kathy's Slow Sunday Stitching and Angie's WIPs Be Gone. 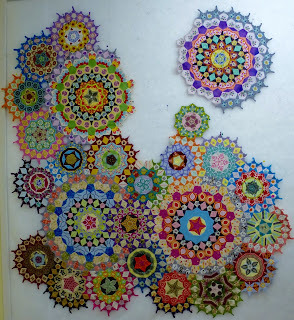 I've made a decision about the outer star points on one of the rosettes, so I think I'll go get started on that now.